Coal is dying out more quickly than ever. While the supply is nowhere near spent, demand is dropping as the push for clean energy strengthens. Where many new energy technologies are being improved and expanded, older, dirtier sources, coal especially, are losing ground. The end goal, of course, is a massive reduction in greenhouse gas emissions. Former President Obama's Clean Power Plan (CPP) called for a cut of U.S. emissions by 32% from 2005 levels by 2030. And while the plan is no longer in effect, the market is still working to make the necessary changes on its own. In fact, the country is already well on its way to lower emissions. In 2005, the U.S. emissions rate was about 6,000 metric tons of carbon dioxide. In 2015, according to the Energy Information Administration (EIA) the rate was less than 5,300, already more than 12% lower than in 2005. With the growth of renewable energy, improvements in nuclear power, and even the boom in natural gas demand, it seems that coal is the only energy source not getting any special treatment. That's not quite the case, and I'll explain why in a moment. The coal industry has been dwindling for years despite the ongoing demand. First, that demand is slowing globally. While gross demand is rising as more energy is needed all over the world, coal's share of energy production is slipping. China, for example, is the largest energy importer in the world and will be cutting coal use over the next few years as the country's smog levels have become dangerously unhealthy. 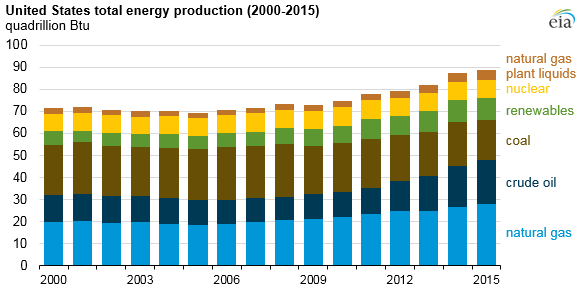 Second, the U.S. shale boom provided the country with an abundance of natural gas. While still a fossil fuel, natural gas emits only about half as much carbon dioxide, one-third as much nitrogen oxides, and only 1% as much sulfur into the air as coal. And now that the U.S. has begun exporting this fuel in the form of liquefied natural gas (LNG), this massive resource is available to the rest of the world too. The shale boom also brought on a new round of technological improvements in the fracking industry, which made the production of natural gas cheaper than that of coal as well. The Environmental Protection Agency (EPA) has estimated that by 2020, geothermal power, combined natural gas cycle power, onshore wind power, and hydropower will all be cheaper per megawatt hour than coal power. OpenEI, a combined effort of the U.S. Department of Energy and the National Renewable Energy Laboratory have estimated that in 2014, onshore wind power, natural gas combined cycle power, geothermal power, and nuclear power were already cheaper per megawatt hour than coal. The past several years have been hard on coal. Natural growth in the use of cleaner energy sources has cut sales margins of U.S. coal miners in half since 2011. The result was the closing of coal miners all over the country. Even the U.S.'s largest metallurgical coal producer, Alpha Natural Resources, was forced to file for Chapter 11 bankruptcy in August, 2015 as business slowed to a crawl. And even without the CPP's regulations, things are not looking up for coal. In December, 2014, the EPA published new regulations on the disposal and storage of coal combustion residuals, or coal ash, that is left over once coal has been used up. The rules state stricter monitoring and upkeep of coal ash storage units, to include stronger liners under landfills, tighter seals to keep water from leeching in, and wells in the area surrounding the storage unit to be regularly tested for any coal-related contaminates in the groundwater. These all came into effect six months after the document was published, giving coal plants time to implement the necessary changes. However, some of the changes were costly, leading to economic failure of companies like Alpha Natural Resources. Worse still are the closures of coal plants all over the world. Already, plants are being shut down or converted into natural gas plants not only across the U.S., but all over the world. The EIA expects that around 14 gigawatts of coal capacity will be shut down by 2028, with each state setting its own goals for these plant retirements much like they would have under the CPP. Many of these closures are to be done in regions where coal has historically been produced, further hurting demand for the commodity right from the source. The next round of new rules in the U.S., which came in late September, 2015, set similar expectations for coal ash disposal in wastewater ponds. The rules also extended to coal power plant scrubbers, which help to reduce overall coal air pollution, but produce toxic metal-heavy wastewater. The EIA estimates that these changes will push coal production back below levels last seen in 1970. Those levels are expected to recover somewhat, but will never rise above 1980s levels again. More expensive changes may be necessary to keep coal power plants running in the future. For now, only the most cost-effective methods are able to stay afloat as the government rails on the energy source. Now that you've seen all the forces working against coal, you'll want to know where to invest as the industry continues its decline. Let's look first at the alternate energy sources and the companies working to develop them. The spread of solar energy is being facilitated by companies like Tesla Inc. (NASDAQ: TSLA), which recently acquired solar installer SolarCity. The company's offering of rooftop solar systems as well as utility-scale solar farms, especially when paired with Tesla's large-scale Powerwall systems, are already powering homes, businesses, and entire communities all over the world! General Electric (NYSE: GE) has its own wind development underway. In June of 2015, the company launched a test phase for a whole new wind turbine design that's estimated to produce at least 3% more power than the traditional turbines. But the company hasn't given up on its traditional wind turbine designs just yet. GE boasts wind products that range from 1 megawatt to 3.2 megawatts in capacity, and services to help plan for, install, and maintain those products once bought. GE also has a hand in the nuclear energy industry. Its partnership with Japanese company Hitachi, called GE Hitachi Nuclear Energy, provides nuclear equipment and services much like its wind turbine business. For long-term gains on natural gas, Cheniere Energy (NYSE: LNG) owns the first of many operational LNG export terminals, currently sending U.S. natural gas to Europe, the Middle East, Asia, and more. With the growth of cleaner energy sources, natural gas — and exported LNG — will be essential as a replacement for coal capacity. If you'll remember, I did say that it was wrong to assume coal wasn't getting its own special treatment. President Donald Trump has been pushing for the revival of the U.S. coal industry since he began his campaign, and his efforts thus far have included shutting down the CPP and removing regulations on coal production. However, for those willing to take the chance to keep coal power running a while longer, add FuelCell Energy Inc. (NASDAQ: FCEL) to your portfolio. The company is a leader in providing reliable and clean power to utilities, universities, and government facilities around the world. Other private companies, such as Midwest Industrial Supply Inc., are offering services to keep the residual dusts left from coal power production safely stored. But even with these innovations ongoing, they may not be enough to stop coal's drop from the U.S. energy portfolio. Coal isn't anywhere near done yet. But it began working its way out before the Clean Power Plan came along, and isn't likely to recover now that the whole world is increasingly against its continued use.